Cervical spinal cord injury (SCI) is often a catastrophic condition requiring chronic care. Despite an enormous amount of research in SCI, the neurological prognosis for a patient with severe SCI remains dismal. Furthermore, majority of the patients with SCI are young, and the economic and societal impact is enormous, both to the immediate family and the society at large. Life expectancy after such an injury is markedly reduced due to complications proportional to the severity of injury or remaining neurologic functions.,, A number of surgical modalities are available for both traumatic and myelopathic conditions of cervical spine. Despite having good radiological results, their impact on socioeconomic status of an individual in developing nations is little known. A few studies have discussed the impact of cervical spine surgery in the developed nation. A study conducted at Singapore shows 80% of the nonambulatory patients who were made ambulatory after cervical fixation. Although these studies show numerically improved neurological grades in postoperative period, little is known about patient's postoperative functional disability or change in socioeconomic status. Despite numerical improvement in the Nurick scores or reduction in the disability index, the patients may not benefit socioeconomically from the treatment. An objective criterion in the developing nation to measure the socioeconomic impact on an individual is the Kuppuswamy score. Patients' satisfaction depends on a number of factors besides adequate fixation such as the postoperative socioeconomic status, modalities of treatment, support from the society, and rehabilitation. The modalities of treatment may vary depending on facility available and person's experience in a mixed economy. In developing nations, majority of individuals from low socioeconomic status live in joint families with a single bread earner. The recent economic growth in the developing nations has aroused global attention toward a promising market in several areas. The health system allows for global medical care, which of course has led to everincreasing expenses in health costs as the demand for new treatment grows. There are also huge discrepancies when comparing medical care in general population. Those who can afford medical insurance or coming from middle and upper socioeconomic class get treated at private hospitals whereas government bears the cost of treatment for majority patients belonging to lower socioeconomic status. The individuals from low socioeconomic status, most of them are laborers, continue to be treated the same way, due to the lack of study on the postsurgical impact of SCI on them. Many of them have little or no impact despite good radiological fixation, as they are unable to resume previous work. Such studies are thus warranted to throw light in the future management of cervical spine injury in the people belonging to lower socioeconomic status. The aim of such a study is not only to know the clinical and radiological outcomes after surgery in SCI but analyze its impact on the socioeconomic condition of an individual and family. Our study questioned that despite good radiological results and improvement in Nurick scale after surgery, the socioeconomic burdens in families have little impact, so the present study aimed at to analyze the clinico-radiological results and socioeconomic impact even after radiologically successful surgery. This retrospective study of 113 patients operated for cervical spine injuries was conducted at a tertiary care university hospital in India from 2007 to 2014. Patients who had cervical spine injury due to trauma or injury after a trivial fall in preexisting asymptomatic cervical stenosis were included in the study. One hundred and sixty-six such patients were operated with either anterior or posterior cervical surgeries during this period were initially enrolled for the study from the hospital records. Twenty-seven of these individuals were not contactable on either phone or the available addresses. Fourteen of the remaining refused to take part in the study or did not qualify the inclusion criteria for low socioeconomic status. Twelve of the individuals expired during the postoperative period. Hence, 113 surviving and traceable individuals were included in the study. 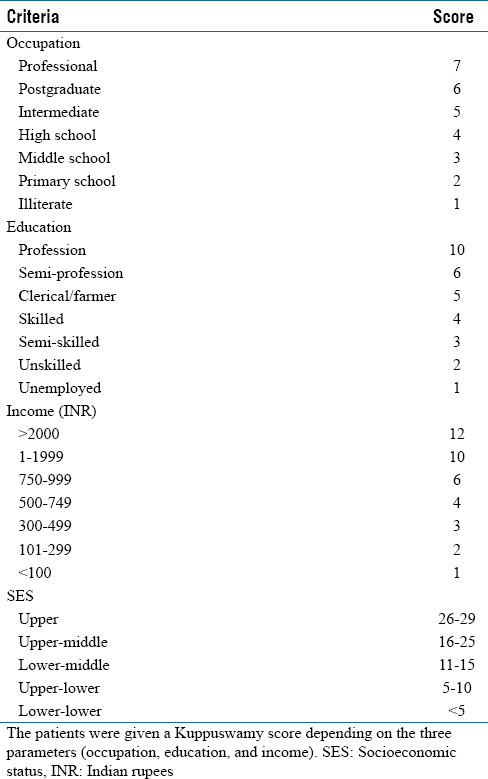 The assessment was conducted under the current ethical guidelines for retrospective studies., The patients were selected from lower middle, upper lower, and lower socioeconomic status with modified Kuppuswamy's score ranging from 0 to 15.,, The participants were either illiterate or had primary school education. The group consisted of unskilled workers or unemployed population. The average income per family was Rs. 2215.13 ± 870.46 ($39.55) per month. Patients belonging to upper middle and upper socioeconomic status were excluded from this study. We have also excluded patient who had cervical cord injury due to infection, tumor, or other pathological problems such as symptomatic cervical stenosis. These patients were informed about the surgical procedure, as evident from the hospital records. They were also made aware of the possible complications. The purpose of the surgery was to prevent further deterioration of neurology. Patients were operated with cervical fixation with or without bone grafting and their neurology was documented in hospital records. Only the patients with a history of trauma in cervical spine were included in the study. Even if the degeneration was present, SCI happened after a traumatic event such as fall or accident with an acute precipitating event. Degenerative symptomatic myelopathy was excluded from the study. Although the hospital stay was subsidized for the patients, they had to bear the cost of implants, which were locally manufactured. The neurology and functional capacity was assessed as per the Nurick scale [Table 1]. The score was assigned in pre- and postoperative periods. Oswestry Disability Index (ODI) score was also assessed in pre- and postoperative stage. The patients were analyzed for changes in the Kuppuswamy score following the surgical procedure by either calling them or visiting the hospital for follow up [Table 2].,, The roentograms (anteroposterior and lateral view) were used for the fixation assessment [Figure 1] by analyzing the fusion across the surgical site. The reply to various questions was asked by one of the investigators on phone, visiting the residence, or during hospital visits. The purpose was to find out the socioeconomic condition of patient and family and if they required any specific help from the government for their rehabilitation, treatment, or occupation. We also asked questions regarding the kind of changes in their social and economic conditions that happened after injury and surgery. Out of 113 patients 87 had traumatic cervical cord injury, while 26 had cervial myelopathy and developed SCI following trivial trauma. 65 (57%) were males [Table 3] and 56 (43%) were females. The average age of the study group was 46.65 ± 16.89 years and 51 patients (46.7%) comprised of laborers and farmers. Since a significant portion of their professional life consisted of physical work, 24 of them (47%) lost their jobs after injury. The individuals belonged to low socioeconomic status as per Kuppuswamy scoring. Spending about 19% (Rs. 414.9 ± 162.89) of the monthly expenditure on the illness further worsened their economic status. Being unskilled laborers, they were unable to find any other employment. Despite showing good radiological fixations, the professional duties could not be resumed, and they had to spend extra on the health management. This further worsened the mental well-being and led into a state of depression. Sixty-three (56%) of the affected individuals had aspirations to get government support in the form of financial help or rehabilitation which was asked on telephonic interview [Table 3]. Nurick scale was used to assess the functioning capability of these patients. Operated patients showed improved Nurick score in the postoperative period [Table 1]. Although the number remained constant for the Grade V patients (n = 36), patients in other grades had significant changes. The Grade IV had 13 patients in the postoperative state versus 23 in a preoperative state indicating that around 10 of them had improved neurology postsurgery. This was supported by the fact that Nurick Grade III had six more patients in the postoperative state versus preoperative condition. 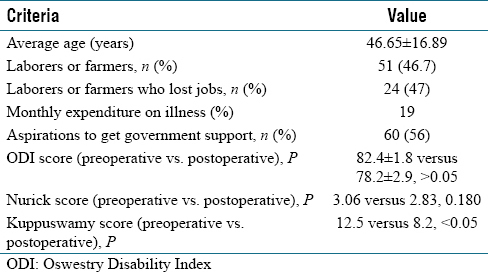 Similarly, ODI scores also went down in postoperative stage from 82.4 to 78.2 (P > 0.05) [Table 3]. These results clearly show that the outcomes were acceptable, not only radiologically but also clinically after postoperative rehabilitation program. Despite numerical improvement in Nurick score and ODI in postoperative periods (3.06 ± 0.18 vs. 2.83 ± 0.17, P = 0.180 and 82.4 ± 1.8 vs. 78.2 ± 2.9, P > 0.05) [Table 3], the P value did not show significance. Moreover, the reduced average Nurick score and good radiological results brought little socioeconomic improvement. The postoperative Kuppuswamy score was significantly low in the operated patients as compared to their previous lifestyles (12.5 ± 2.5 vs. 8.2 ± 1.5, P < 0.05) [Table 3]. The majority of population in developing nations consist of individuals from low socioeconomic status. With tremendous research done on spine surgery and its fixation modalities, little is known about its socioeconomic impact. A number of studies have shown improvement in the postoperative neurological outcomes.,, The neurological outcome has been simply classified by various grades. However, there is little evidence that an improvement in a neurological grade affects the individual's working capability in the society, despite giving satisfactory results both radiologically and clinically. In two separate studies at the USA by Deutsch et al. and Grob, the postoperative neurological improvement after cervical fixation was found to be around 75%–90%.,, Gao et al. from China reported it to be around 63%. In these studies, the improvement in neurology was considered to be any regression in the neurological grades in postoperative period. This corresponds with our study which shows around 76% improvement in the neurological outcome after cervical spine fixation. Tan and Hee from Singapore reported that 80% of the nonambulatory patients became ambulatory after spinal fixation. However, none of the studies have focused on socioeconomic aspects involved after the surgery. In the present study, we have focused on such issues in lower income group where the major part of the family income is spent on daily living. Kuppuswamy method involves the measurement of three parameters while calculating the socioeconomic score for an individual [Table 2]., Occupation, education, and income of the patient are given scores and a total sum of < 15 is considered to be in low socioeconomic status., In this study, the patients had a significant reduction in the Kuppuswamy score in the postoperative period. This signifies further deterioration in the socioeconomic status of the individuals on long term follow up, thus little satisfaction was noticed in the operated patients. The satisfaction of an individual to treatment modalities varies in developing versus developed world. Probable reasons for it could be the difference in the per capita income and spending capabilities. Moreover, there is a higher level of support from the government in developed world versus the developing nations. The social security measures and the compulsory insurance cover give better postoperative rehabilitative facilities to individuals in higher per capita income nations. In our study, 56% of the affected individuals had aspirations to get government support in the form of either financial or occupational support so that they can reach out to their daily living [Table 3]. In the present time it seems to be equally important to know how a surgery affects an individual's position in the society. High-income group of patients, who can afford nursing care and have social securities, may require a different modality of treatment as compared with unskilled laborers who even cannot afford basic hospital expenditures. Moreover, postoperative Kuppuswamy score is affected more in a laborer as compared to a professional high earning desk worker as the scores for both occupation and income are affected. Furthermore, the scores for education are also low in illiterate population. The functional status of the patients made it difficult for them to return back to their employment. Majority of the individuals in the study were either laborers or farmers who could not resume their jobs due to neurology worsening following the injury. Although certain surgical complications such as C5 nerve root pain or superficial wound infections were noted, they did not contribute to poorer outcomes. Majority of these individuals still are unemployed with little satisfaction. Despite good radiological fixations and numerically improved clinical scores, these individuals continue to live with further deterioration of the socioeconomic status and little satisfaction. Through a convergence of social, political, and environmental factors, it may be possible to further investigate and assess the socioeconomic outcomes of such an intervention. Besides surgery, a novel postoperative rehabilitation and physiotherapy may pave a way for better outcomes in developing nations as compared to the developed ones. A family which is unable to support its daily living may not be able to spend on expensive rehabilitation schools. Such an individual thus becomes a liability and eventually suffers from improper physical and mental well-being. Developing nations may introduce inexpensive rehabilitation measures which might give job securities and confidence to unskilled laborers who did not recover fully postsurgery. Global efforts to expand joint planning, information sharing, and financial support of a range of global efforts aimed at early detection, verification, and response are increasingly important. Failure to jointly pursue these goals in a balanced approach will only lead to increased discrepancy and little impact of surgical cervical fixations in developing nations. The effects of such an initiative can be far-reaching and involve many members of the society. These are also not only limited to the cervical spinal injury itself but also can be instigated for a number of such illnesses. A question that arises at this point is the importance of quality of life and life expectancy., Although the current methodology of cervical spinal injury management provides both in developed nations, it has little contribution to the quality of life in the developing world. With the increasing incidence of cervical spondylopathy and myelopathy in the developing world, it seems equally important to explore novel methods of treatments or rehabilitations which would be satisfactory to the population. Government and other agencies should invest in community research and methods of rehabilitations after such an injury. Social security measures, job securities, and vocational training as per the ability of such an individual may prove beneficial. This may open a new study having a long-lasting social impact concerning public health. These findings highlight a socioeconomic impact after cervical spine injury and are first of its kind in a lower socioeconomic group. An improvement in the postoperative Nurick grade or reduction in ODI scores does not improve the socioeconomic status of an individual in lower income group population. A cervical spinal surgery should be attempted by keeping in mind the expected surgical outcome, socioeconomic status of an individual, available rehabilitation programs, and their costs. Cervical spine surgery alone does not make sure of a good functional outcome for the patients of SCI or myelopathy. What is also required is a good rehabilitation program, which is always a challenge in the lower socioeconomic group. Such studies may further throw light in the future management of cervical spine injuries in this group. Frankel HL, Coll JR, Charlifue SW, Whiteneck GG, Gardner BP, Jamous MA, et al. Long-term survival in spinal cord injury: A fifty year investigation. Spinal Cord 1998;36:266-74. DeVivo MJ, Black KJ, Stover SL. Causes of death during the first 12 years after spinal cord injury. Arch Phys Med Rehabil 1993;74:248-54. Shavelle RM, DeVivo MJ, Strauss DJ, Paculdo DR, Lammertse DP, Day SM, et al. Long-term survival of persons ventilator dependent after spinal cord injury. J Spinal Cord Med 2006;29:511-9. Shamji MF, Cook C, Pietrobon R, Tackett S, Brown C, Isaacs RE, et al. 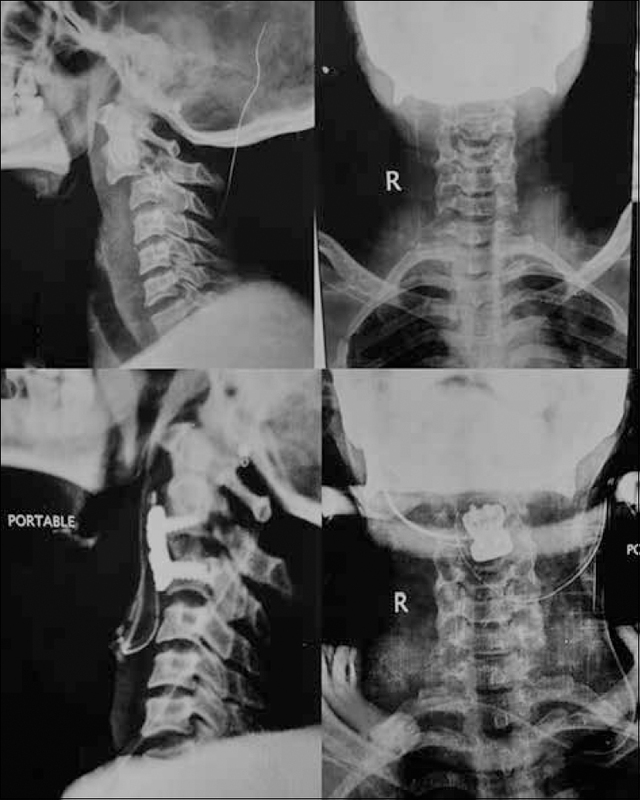 Impact of surgical approach on complications and resource utilization of cervical spine fusion: A nationwide perspective to the surgical treatment of diffuse cervical spondylosis. Spine J 2009;9:31-8. Tan KJ, Hee HT. Neurological recovery after occipitocervical fixation. J Orthop Surg (Hong Kong) 2007;15:323-6. Sharma R. Kuppuswamy's socioeconomic status scale – Revision for 2011 and formula for real-time updating. Indian J Pediatr 2012;79:961-2. Repetto L, Comandini D, Mammoliti S. Life expectancy, comorbidity and quality of life: The treatment equation in the older cancer patients. Crit Rev Oncol Hematol 2001;37:147-52. Kiraç FS. Is ethics approval necessary for all trials? A Clear but not certain process. Mol Imaging Radionucl Ther 2013;22:73-5. Junod V, Elger B. Retrospective research: What are the ethical and legal requirements? Swiss Med Wkly 2010;140:w13041. Sharma R, Saini NK. A critical appraisal of kuppuswamy's socioeconomic status scale in the present scenario. J Family Med Prim Care 2014;3:3-4. Revanappa KK, Rajshekhar V. Comparison of Nurick grading system and modified Japanese Orthopaedic Association scoring system in evaluation of patients with cervical spondylotic myelopathy. Eur Spine J 2011;20:1545-51. Fairbank J. Use of oswestry disability index (ODI) Spine (Phila Pa 1976) 1995;20:1535-7. Conger RD, Conger KJ, Martin MJ. Socioeconomic status, family processes, and individual development. J Marriage Fam 2010;72:685-704. Gao R, Yang L, Chen H, Liu Y, Liang L, Yuan W, et al. Long term results of anterior corpectomy and fusion for cervical spondylotic myelopathy. PLoS One 2012;7:e34811. Deutsch H, Haid RW Jr., Rodts GE Jr., Mummaneni PV. Occipitocervical fixation: Long-term results. Spine (Phila Pa 1976) 2005;30:530-5. Grob D. Comment to “Posterior compact Cotrel-Dubousset instrumentation for occipitocervical, cervical and cervicothoracic fusion” by P. Korovessis et al. Eur Spine J 2001;10:395. Grob D, Dvorak J, Gschwend N, Froehlich M. Posterior occipito-cervical fusion in rheumatoid arthritis. Arch Orthop Trauma Surg 1990;110:38-44. Röijezon U, Björklund M, Bergenheim M, Djupsjöbacka M. A novel method for neck coordination exercise – A pilot study on persons with chronic non-specific neck pain. J Neuroeng Rehabil 2008;5:36. Naidoo RN, Haq SA. Occupational use syndromes. Best Pract Res Clin Rheumatol 2008;22:677-91.